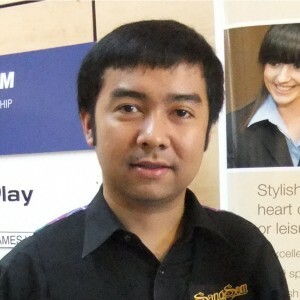 Twice a runner-up in the Asian Championship, Noppadol Sangnil made it back on the main tour for 2009/10 season following a consistent season on the PIOS in which he won at least one match in each event, once going all the way to the final before losing out to Xiao Guodong in a deciding frame. In October 2009 it was announced that Noppadol would be managed by 110sport, joining the likes of Stephen Hendry and Ken Doherty as part of their stable. With just six events scheduled for the 2009/10 season, Noppadol needed a good start to the season to give himself a good chance of retaining a place on the tour for the following year and he started well in qualifying for the Shanghai Masters. Drawn against countryman James Wattana, Noppadol recovered from losing the opening frame to record a 5-2 win, before moving into the third round with a victory over the struggling David Roe. Though he lost out to Adrian Gunnell in the next round, he had at least got a solid 1260 points on the board from the event. Unfortunately however he could not maintain this level of performance and was to lose his opening match in the next four ranking events. As a result, despite a 10-9 victory over talented Welsh youngster Michael White at the World Championship, he was to be relegated from the tour at the end of the season.